I haven't got one (yet) but is there a plan to put an F01/F02 forum up? As Tim says we don't have any members with an F01/02/03..It could be your the first?, would be interesting to have a member with one whom could submit all the good points and bad, as no way do I want a e65/66 and sad to say the e38 is now becoming a money pit . Interests:Vehicle Restorations,Racing, flying and Family and Friends. Professional: Business Owner Ranching - Cattle (Big Pets in reality). I had an E65 for a year and after I sold it they added the E65! Well have to wait for a moderator or a key individual of the "Seven Series Register" to get one before it's added. It depends on what happens with work. The X5 hasn't turned a wheel for 6 weeks and I use an F10 520d everyday currently ( superb car by the way). I have the option to buy the X5 outright in March for the balloon value which for an E70 is cheap but F01s are getting more price attractive. I could also be tempted in to another E65 750i if I could find a good one with a bonkers spec. As for steering clear of the E65, I think the LCI model was a safer bet but the F01/2 won't be any less complex than the E65/6. On the basis that I now may possibly be the first F01 owner on here , can someone start an F01 forum pretty please? Edited by V12 EGO, 28 June 2014 - 07:25 PM. We've had one for ages (well, at least a couple of minutes). Interests:BMW cars, and in my past life, BMW motorcycles. I like the F01, will hope to get one one day. There don't seem to be the same variety of colours you see with the E38 though, have all the buyers gone boring? Nice looking V8 and I guess a massive step up from the E38 in comfort and toys. I do think the F01 is an improvement over the E65/66 just a shame so many are used as high end mini cabs, but I guess that's why most are diesels and come in black or silver. Having said that my Dad's driver has just got a blue one after several XJ Jags, S Class Mercs and a big Lexus and he seems happy with it as a work tool. "There's a difference between knowing your sh1t and knowing you're sh1t"
We've got two!!! Great looking car as well! I saw that one for sale and the colour appealed but my Mrs would have lynched me if I get a V8 petrol!! Very nice. Thank you for the compliments, I am still getting used to it, it is indeed a significant upgrade from the E38. As I wrote elsewhere when I put the 750 Sport up for sale, my wife really hated it, so much so that when we went to view this one (it is a BMW Approved Car), she went by train while I drove the 750 Sport. The car is very comfortable (my wife's only real criterion) which is probably partly the difference between the 150,000 miles on the other E38, and this one, which has about 35,000 on it. I think this might be viewed as a little high for a two-year old car, but with my 6,000 miles a year, it will soon settle back into the "average" miles per year. I talked to the local BMW dealer and test drove a black 3.0 diesel, and while it is a workmanlike car, it didn't appeal… I have got used to the 'lazy' power of the petrol 750 in the E38, and although the diesel was possibly the equal (or more) in power, torque, etc, it just didn't feel right to me. I was another that had suggested and was keen to see an F01 section. So I am pleased to see that we now have one! Edited by ZimmZimma, 02 July 2014 - 08:39 AM. 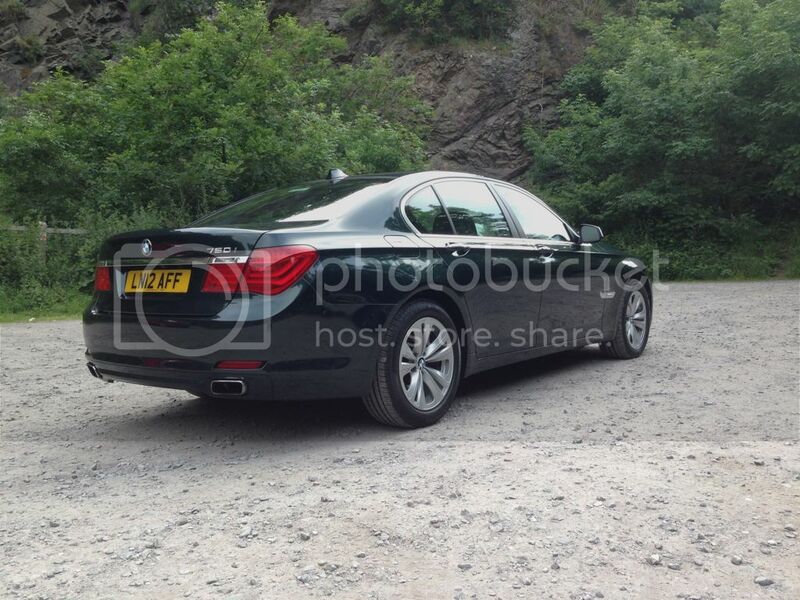 The 750i will gave a bucket more power and I suspect (without checking) less torque. I did have my eye on a well spec'd 750li at a non-main agent but it had higher miles and was more than I wanted to pay. The other thing that didn't appeal was the prospect of handing over £500 every year for road tax just to be donated to Brussels. Ok, let me reserect this this post... I am looking for a white, or light silver F01... or is it the F02 at L length?? You are correct, F02 is the LWB version. I sold my 730d in June 2016 as it wasn't getting used but I didn't have anything go that was covered by warranty. From memory I had a side view camera mist up that was changed and the only major thing was the brake servo gave up as a recall hadn't been actioned where it sucked up oil vapour from the inlet manifold that condensed and knackered it. I was in a courtesy car for a month as BMW couldn't get the parts. Maintenance is relatively pricey, a full set of front disks and pads with labour will probably set you back the wrong side of £600 at a main agent. If you are looking to do some distance, I would look at the LCI version (2012 onwards) as stop start was introduced and the power of the 30d and 40d engines was increased. The performance gap also dropped between the two so the 730d LCi will do 0-60 in around 6.4s while the 750d is in the high 5s. Just make sure everythign works if you buy one and try and get a good warranty. I managed to get two years' unlimited mileage warranty from BMW when I bought mine that covers just about everything. Make that 3! Just before Christmas my 760 was hit while parked and subsequently written off so I am now the owner of a 2010 730d M Sport. No where near the spec of the E66 but still a nice car with a few options like keyless entry and heated steering wheel. Took her for an MOT on Saturday and she passed with only a small crack on 1 of the wheels which can be welded so quite happy now and performance is on a par with my E38 740 so no complaints. Hopefully she’ll serve me as well as the precious 6 have!